Dhaka Medical College and Hospital (DMCH) established in 1946, it took about 10 years for the institution to get started after completion of government formalities. 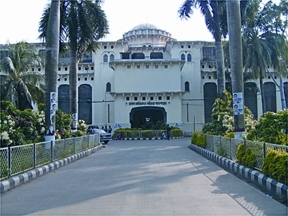 The Dhaka Medical College and its affiliate, Dhaka Medical College Hospital, were accommodated in a building constructed in 1904 as the Secretariat Building for the province of East Bengal and Assam. The building was transferred to the university of dhaka in 1921. One part of it was converted into the university’s medical centre, another part into a student dormitory, while the residual part was allotted for use as the academic wing of the Faculty of Arts. The whole building was used as ‘American Base Hospital’ during World War II. When the Americans left, a one hundred bed hospital was established in it. This created the base of the DMCH, which at the beginning had only four departments - Medicine, Surgery, Gynaecology and ENT. The institute did not have any hostel for students. Male students were allowed to reside in Dhaka University’s student halls, but girls had to attend classes from their homes. After the partition of Bengal in 1947, a large number of students came from Calcutta Medical College and sought admission in Dhaka Medical College. Similarly, many left Dhaka Medical College for Calcutta. The college and hospital premises were expanded in new temporary sheds, some of which were built for outdoor services of the hospital and some others for students’ hostels. New buildings for hostel, college and hospital were constructed in phases: a hostel for girls in 1952, a hostel for male students in 1954-55, a new complex of academic buildings in 1955, and a hostel for internee doctors in 1974-75.